When it comes to etiquette, there's a rule for everything, isn't there? In general, important letters have all sorts of guidelines, whether you're sending out a resume or wedding invitation. 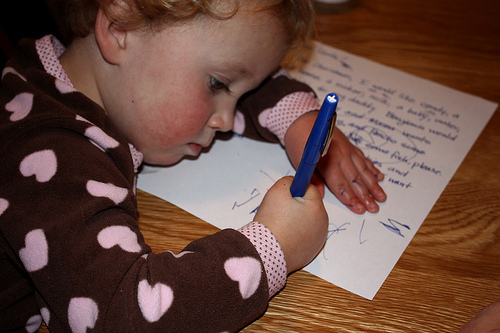 Luckily, when it comes to a letter to Santa, it's totally up to the author how it's written. It can be as formal or candid as the writer likes and Santa isn't going to turn you in to Ms. Manners if you skip the small talk and get down to the nitty gritty, though I have it on good authority he's fond of a little buttering up. The question some people ask is whether it's better to type a letter or write it by hand. The short answer is that there's no right or wrong. I can, however, guide you toward an informed decision. Typed or handwritten? Let's break it down. A typewritten letter doesn't have the same charm as a handwritten one. It just doesn't. Sorry. On Santa's end, handwritten letters are more interesting keepsakes, because they're more personal and reflect the writer's age. Handwritten letters often offer some extra space to draw a picture, which Santa feels is like a special gift to him. At the end of the day, whether you're a typed or handwritten type of family, a letter to Santa is like a Christmas present. What matters is the content, the rest is just gift wrap.